Nice one, i always liked the MegaZoom ASIC scopes. Its digital yet still feels so analog with its nice speed, responsiveness and intensity gradation. So what are the other 3 pieces of gear? I already have a 54600B (older, no zoomies) and I love the interface and measurement functions of this era of HP scopes. So, one of the reasons I went for the 54642D was the familiarity and love for the interface. And I've heard so many good things about it "analogue-ness" that it seemed the obvious pick! The 16ch digital was the killer feature for me however. No decoding, but that's OK. I'll get a USB logic analyzer for that eventually, if I need it. As for the other gear.... Well, I picked up a "not working" LeCroy WaveJet 314, according to the seller it failed a self-cal on Ch 3, but appeared to work perfectly well regardless. Going to fix it, and if I don't love it, I'll re-sell it (most likely). Could be nice to have a 4ch beater scope. Shipping cost more than the scope. Go figure. Then I picked up a vintage HP 6825A Bipolar supply / amp, I made a restoration thread in the Repair forum for that one. And I might have gotten a GPSDO, still in transit. Cool stuff, Haatveit. You're welcome at the TEA house anytime. Got that neat guy from a colleague, saying "Better you take it before I'm gonna dispose it"
It's in pretty good nick, and working. Does it count as a score if the price is 4 digits? Well, it's a score for me... Or the seller. I'm not quite sure. I love the 54642D, the UI is the killer feature, super simple and intuitive to use, and the fastest response in any DSO I’ve used. Sure, it doesn’t have serial decoders (it does have some serial triggers), but unlike the 54622D, the 54642D is realtime throughout its timebase range, with a 500MHz bandwidth. Oh, did I mention the five second boot time? Only downsides other than the serial decode are monochrome display and only two analogue channels, but it’s still a wonderful scope and a complete joy to use. Nice score! Sometimes you just have to take a risk. Unforcenetly i got things put on my repair queue due to my own gear breaking. R&S SMH 2GHz RF gen. 2x. One probably already sold. I love all those buttons ! If you don't mind, where'd it all come from? Wow, lots of neat stuff. i.e., alias for TEA. Rather appropriate that you have it in your username. Not saying I don't end up with the occasional lemon, but all in all I end up on top. And have some fun too! Crud. Buyer backed out of the UPL deal. Back on the market! 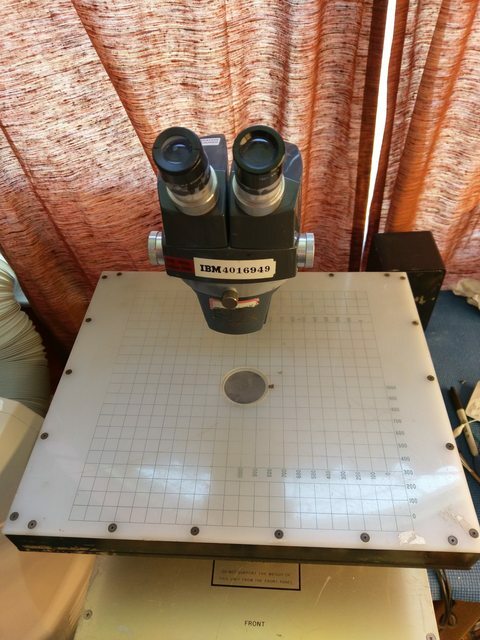 An American optical inspection station with a light table used by IBM. has both internal and external mirrors too to direct light on top of and underneath the item being magnified. I picked it up at a local surplus shop. A little dusty, but the optics look clear. a few lights scratches on the light table surface. outdated for IBM I assume, but good enough for me! the tape around the eyepieces was to just keep them from getting separated from the microscope while moving it around. I haven't cleaned it up yet, this is just how I got it. 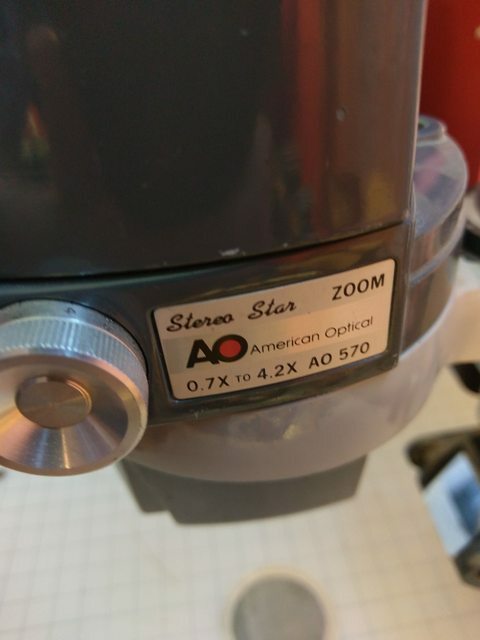 I've tried to search the internet to see if i could find something like it, and though i easily found the optics on the internet, I haven't found the table anyplace. I wonder if it was some custom setup just for IBM. anyway, always wanted a stereo inspection station.. I'm guessing you've seen most of the gear I got in action already, so I won't bother you with it but this Marconi gear is pretty neat. I proudly present the Marconi 2383 4.2GHz SA! - Proudly made in the UK. - Old. Anyone any clue? - Heavy. Like a boat anchor. For the Titanic. - None of this funny "menu" stuff. Everything has dedicated keys. Except for a few "shift" functions. But I imagine that once you get the hang of this thing you'd be twice as fast as on one of those newfangled menu pieces of gear. EDIT: forum rotates the images. Don't know why. Gotta love those dedicated knobs and buttons for pretty much every function. That is some beautiful bit of Macroni. Well done Ice-Tea.